Shareholders in Ryanair have called for changes in the governance structures of the company, urging that the chairman is replaced. As well as recommending the end of David Bonderman’s 22-year tenure, the Local Authority Pension Fund Forum (LAPFF) wants the budget carrier to start developing a succession plan for chief executive Michael O’Leary. The LAPFF, which claims recent industrial disputes involving airline management and disgruntled staff have highlighted the need for reform, intends to file resolutions at the company’s next AGM urging the leadership moves. The forum represents pension funds of UK local authorities and has combined assets worth more than £230 billion. It holds around 1% of Ryanair’s shares. To file a shareholder resolution at an Irish company’s AGM the backing of 3% of the shares is required. LAPFF has said it intends to engage with other shareholders to secure support for the resolutions. At Ryanair’s last AGM in Dublin in September, almost 30% of shareholders opposed the reappointment of Mr Bonderman. Mr O’Leary was reappointed with 98.5% support. LAPFF chairman Ian Greenwood wrote to Michael Cawley, chairman of Ryanair’s nomination committee, earlier this month informing him of the forum’s intention to file the resolutions at Ryanair’s next AGM, scheduled for September 19 next year. The resolutions will call for the replacement of Mr Bonderman by the end of 2019 and the communication to shareholders of succession plans for Mr O’Leary as soon as is practical. He acknowledged the company was making efforts to improve its “attractiveness as an employer”. 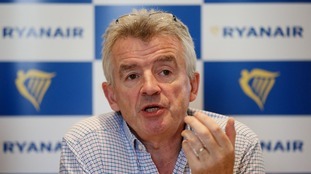 “However, Ryanair’s governance has not kept pace with these changes,” he added.